After seeing that the Chocolate Kalakand was a hit, I started thinking what else can be twisted with chocolate. When my relatives visited us, I thought of making gulab jamuns. However I didn’t get time and those ready mix packets were lying around still. When the idea came to mind, I was so happy that I could do something new with the old stuff. I knew my kids won’t eat gulab jamuns, so making it with chocolate, I was sure they will love it. Since it was a sweet I safely thought I could do it once they go to sleep. The many memories of Amma making it late night came to mind. Since childhood, all birthdays and special festivals are marked with Gulab Jamun making. 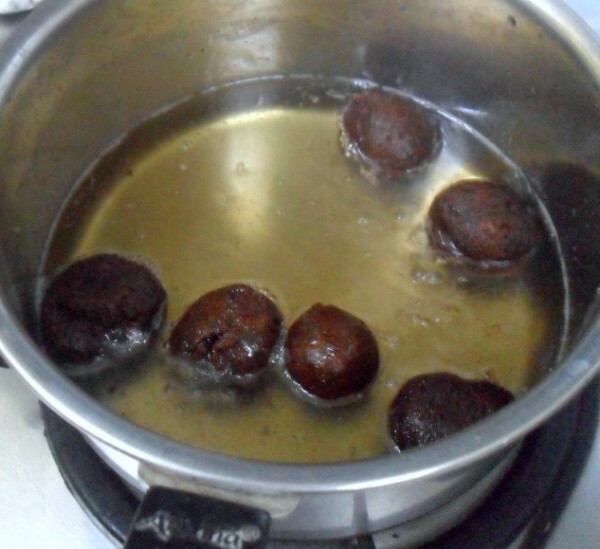 Amma always used to make it late night and by morning, I would eagerly wake up to see those fried balls turned as monsters after dunking all the syrup. In all her experience of making gulab jamun, I don’t think we have ever had a failed experience. And the batch used to last couple of days depending on the occasion. I like it cold and hot as well. 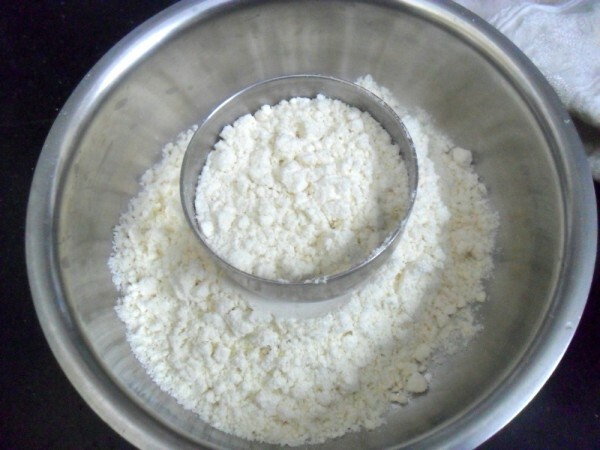 I was surprised that though I practically grew up with this sweet, I have never made in my kitchen with a ready mix, other than the times I made for Indian Cooking Challenge. During this challenge, I had made from the scratch each time I made. Thinking of this sweet, also reminds me of my friend who made it for the first time when we were kids. She thought one has to roll out the balls big before frying and soak. So she made huge balls and soaked. Once these got soaked, they turned out to be tennis balls! We had such fun teasing her on her experiment. So using a ready mix was a first time experience for myself. 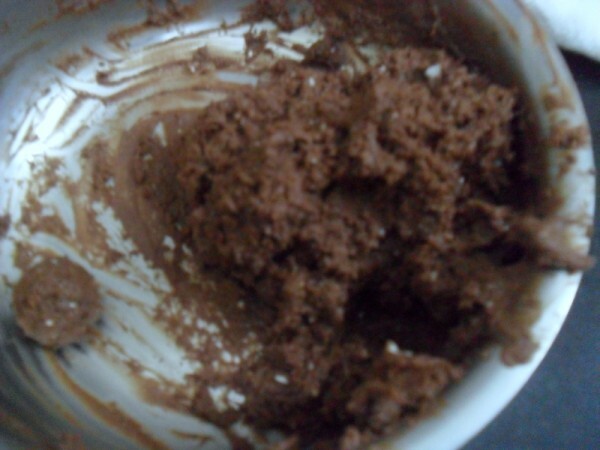 When I had set up to make, I was debating if I should use melted chocolate or Cocoa powder. I settled with Cocoa powder with a chocolate bit as a stuffing. I knew somehow adding the cocoa might make the dough sticky. As expected it did towards the end. 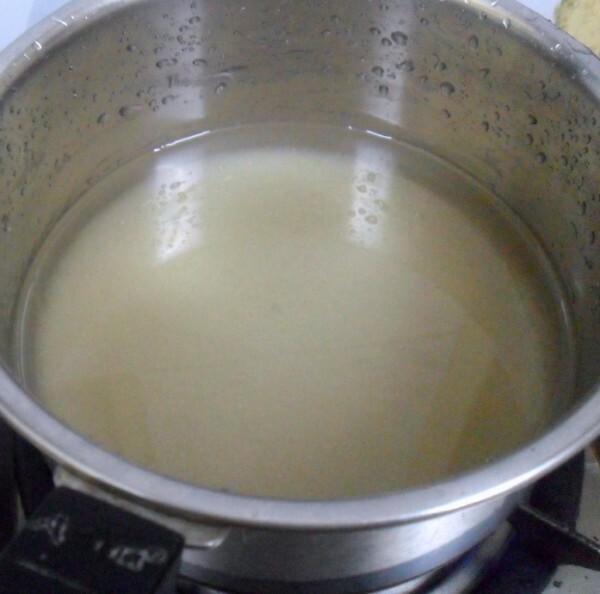 Care should be taken to add water little by little to get a stiff dough. My brother’s family had come down the day I made this and the kids were so busy. I hurriedly packed some for my colleagues and they were surprised that I would think of such combinations. Everything was licked clean, with some comments like they didn’t know if it was halwa or gulab jamun. One batch towards the end, got disintegrated into the sugar syrup and I didn’t remove it out. 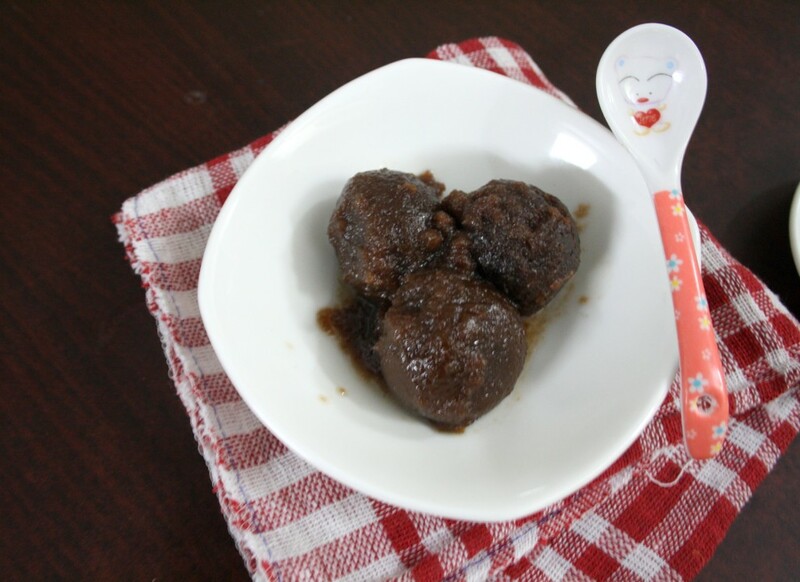 After knowing that the taste was awesome, I offered to my kids and I was so glad that both Konda and Peddu loved it. Chinnu refused to eat though being tempted to note that it was chocolate. However after the first gulp, he was sticking to my side. Konda pointed out to me that maybe Chinnu wants another bite. I saw Chinnu nodding his head and looking sheepishly wanting another bite. So you know end of the story, the entire bowl was finished within minutes. I had to tell my friends that what they tasted was the last of the chocolate gulab jamun. And the next will happen if I make it again. Surprisingly hubby dear who doesn’t like anything twisted or fusion, said this was very good. In a wide bowl, empty the gulab jamun mix. I measured it out to be 2 & 1/2 cups. 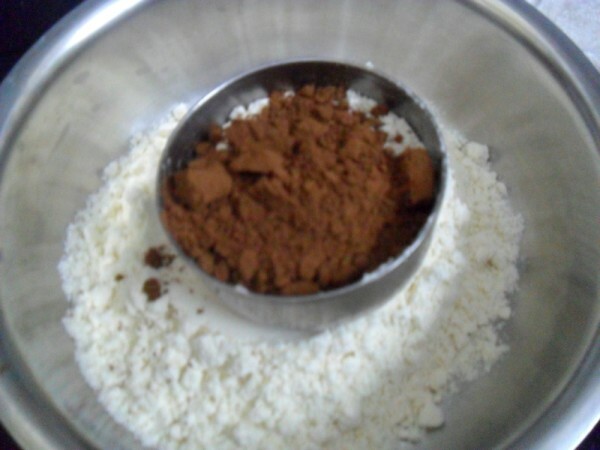 Add cocao powder and mix well. Now slowly add water by 1/4 cup and knead to a soft and pliable dough. Let it rest for 10 mins. Heat a kadai with oil and ghee, Keep it on low. In a pan, take the sugar and mix with water. Bring to boil, remove scum if any. Then again cook for 15 mins on medium flame. As such for this syrup, we are not particular about the thread consistency. The sugar should boil for 15 mins in low flame. Once done, cover with lid and keep it ready. Divide the mix into small balls, stuff the chocolate bits in between and enclose it well and gently drop into the oil. Make sure the oil is on low – medium flame. Fry in batches for best results. And flip it on all sides to cook the balls to colour. Once it’s done, it takes about 3 -4 mins or less, drop the fried balls into the simmering sugar syrup. 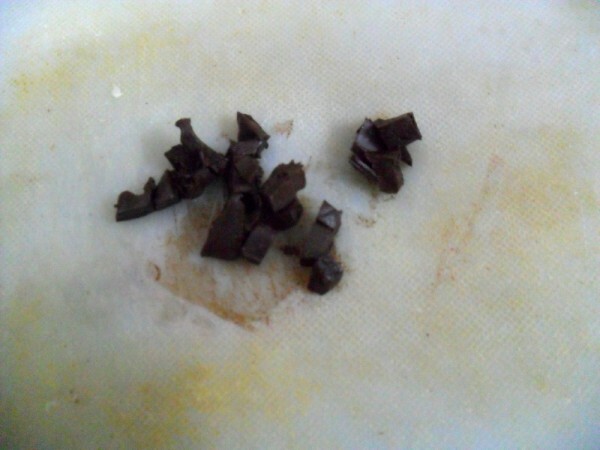 Since these jamuns are dark in colour, it’s quite hard to make out when these are cooked. So check it out for 3 – 4 mins. It should be done. Also once the syrup is made, continue to keep it on flame when you are dropping the fried balls. 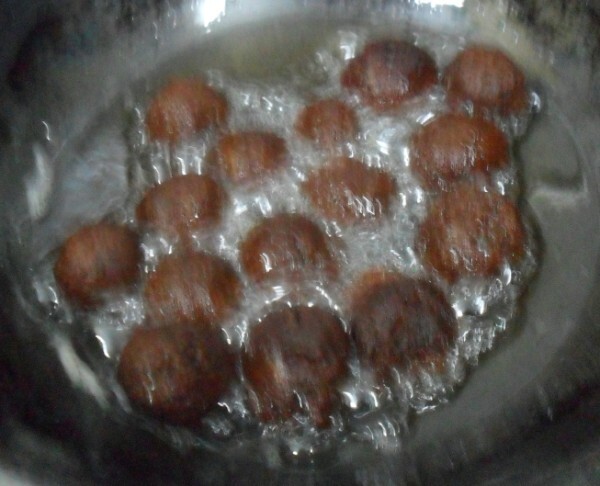 Once all the balls are fried, let it soak in the sugar syrup for a while. Most we keep it overnight. Sending this to Kalyani who is hosting my Kid’s Delight Event, themed on Kids Party Ideas. I am sure kids would love these chocolate twists! choco jamuns ! who can resist these ! 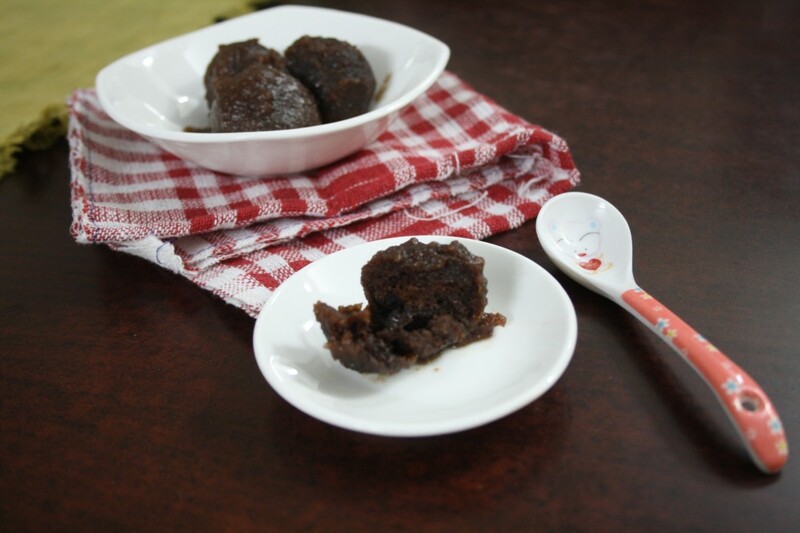 Can't imagine gulab jamun with chocolate…great idea!! Even i planned to prepare these choco jamuns when i choosed this theme for the first week,but finally i couldnt make it..They looks droolworthy Valli. Nice twist to traditional sweet. Yummy looking gulab jamuns – love the chocolate twist. I'll try this for my son, may be he'll start liking gulab jamuns. My favourite. What a great idea to use chocolate. 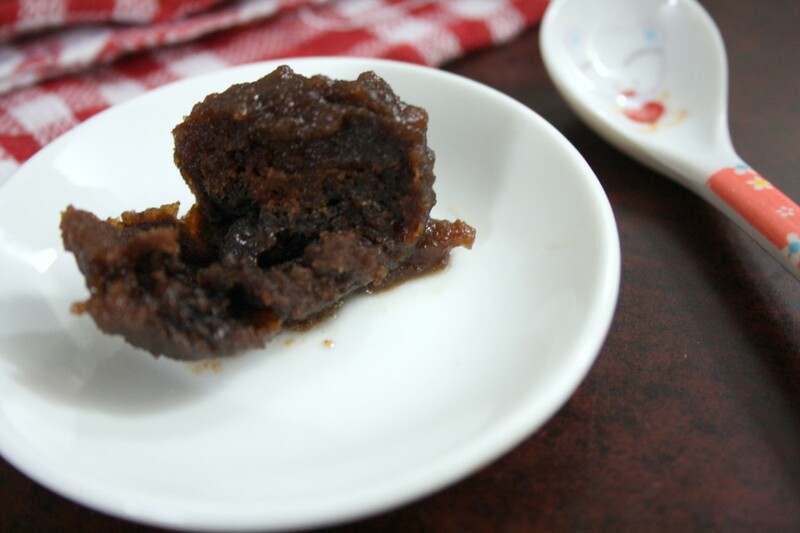 I made chocolate jamuns with choco chip filling. Next time i will add cocoa powder. Wow Valli you got a perfect color very tempting.. Very clever version!! The kids would love it! Love this version, love the stuffing part.